Saturday 13th October: Up early in the morning (well, early for me at the weekend) and off to catch the train from Leeds to Manchester. The venue for Authors North this time was the splendid Midland Hotel in Manchester. Still feeling a bit groggy from the swansong of a cold (that’s my excuse anyway) I forgot to take my camera, meaning this is a picture-less post of the meeting, sorry. The first speaker was Alison Baverstock, talking about why self-publishing is now just publishing and looking at what the associated processes and technology have to teach authors, publishers and readers. Alison reminded us how authors have been reliant on mainstream publishers for dissemination of their work to traditional retailers only. Authors were marginalised in the publishing process. Self-publishing was seen as a dirty word. But this, she says, has changed. Technology has revolutionalised the business. Independence is now seen as positive for authors. The processes of publication are achieved differently, with authors, the ‘content creators’, gaining confidence with their involvement in marketing. We now have the rise of the author entrepreneur. I must say all this made me sit up and think. I have never thought of self-publishing in such a positive light. Personally I don’t fancy self-publishing. I found it difficult enough to push myself forward into the world of marketing, which every author now has to do. But really going it alone, self-publishing, would have been far more scary for me and I can’t see how I would have had any chance of getting my books into outlets such as Waterstones without my lovely publishers to do it for me. But I divert. I meant to give an objective summary and here I am pushing my nose in with my own opinion and feelings. Alison spoke about the assistance available to self-published authors for finding readers: the internet with its wide opportunities of social media, professional publishing for self funding authors, print-on-demand, ebook technology, forums, sites such as authonomy, individual services, and so on. No doubt there are highly successful self-publishers, and many self-published books are of good quality. Quality was seen as of paramount importance, which can more likely be achieved with authors buying the services of freelance proof readers, editors and cover designers, in addition to using feedback services and ‘book doctors’ such as The Literary Consultancy. Alison also pointed out the need for writers to boundary their time. Some writers spend too much of their time tweeting, facebooking and blogging until they have no time for writing their books. (Yes, erm, point taken). We had a break for a buffet lunch. At the back of the long table of food set out for the gobblers of anything, was a small table on its own containing a plate of sandwiches labelled ‘Vegan’. Ian hurried to this and stood in front of it munching his sandwiches, while guarding this table ferociously. He held his fork at the ready to stab the fingers of anybody who might just have fancied an addition to their dead cow sandwiches and dared to encroach. (It’s hard to blame him when there was nothing vegan left for him but one lonely rice cake at a previous event). I must say that one of the nicest things about the Authors North Meetings is down to the people who attend. They are a lovely, interesting, friendly bunch. It was great seeing people I’ve met previously and catching up on their news. The afternoon talk by Peter Hobbs was about Imagination and the Novel. He looked at the questions: Why do we tell stories? Why do we still write novels? What is ‘literary’? He began his talk by drawing on the theories of evolutionary psychologists who see art/stories as a development of the pleasure instinct, with its advantages in terms of social interaction, co-operation, creative thinking and problem-solving. In other words, art (including story telling) is an adaptive trait, useful for survival. While Peter enjoys engaging with evolutionary psychology, he spoke of feeling sceptical about it. He pointed out that evolutionary psychologists skip over the concept of consciousness, drawing on their theories from the evolution of behaviour, without asking artists themselves why they tell stories. I think it was at this point that Peter’s talk became philosophical, bravely entering territory about the nature of reality. He believes that the external world is real but our powers of imagination cause us each to perceive reality differently and therefore to see different things in the same setting. To comprehend the world we tell stories – sometimes consciously and sometimes not. We use our imagination in the act of telling stories and reading. It is imagination and narrative that makes us human, what we are. We tell stories because it’s in our nature to do so. The novel is one of the greatest tools we have to look at the world, to understand human life. Peter believes that to see ‘literary fiction’ as one genre among many is to miss the point. It is the kind of literature that tries to be true about human motivations, actions and consequences, but it is not related to a particular genre. Science fiction or Young Adult novels can also be ‘literary’. The definition cuts through different genres. ‘Literary’ means writing that is concerned with style. The sentence is the unit of beauty. He said the pattern and sound of language is as important as content in literary novels. I liked the way he said ‘as important’ and not ‘more important’. A tweet written recently by Joanne Harris has suddenly popped into my mind, which makes a lot of sense to me: ‘Neglecting plot in favour of style is like building a car with perfect upholstery, but no wheels and engine…’ I want the perfect upholstery but also the wheels and engine. (Oops, here I go again, poking my nose in with my own views and feelings). I hope I have been fair to Peter Hobbs in attempting to summarise what I found to be a complicated but fascinating talk. 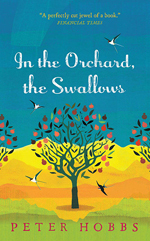 I spoke to him afterwards and, ooh, what a nice person he is, so I simply had to buy his book: ‘In the Orchard, the Swallows’. I’m now going to curl up on the sofa and start reading it. So thanks, once again, to Authors North for an interesting and thought-provoking meeting. This entry was posted in Books, Writing and tagged Alison Baverstock, Authors North, books, Peter Hobbs, Society of Authors by Jean Davison. Bookmark the permalink. When you coming around for Gnocchi? vegan of course! Vegan Gnocchi. Yea!!! But watch out for your fingers!